What if everyone in a city flushed their toilets at once? If all people flushed their toilets at once, the city water mains would burst. How much damage (if at all) will a drainage system in a modern city incur if every household flushed their toilets at once? Here the green represents the previous day while the blue is the day of the game. Note the preparation before the game and the intermissions. 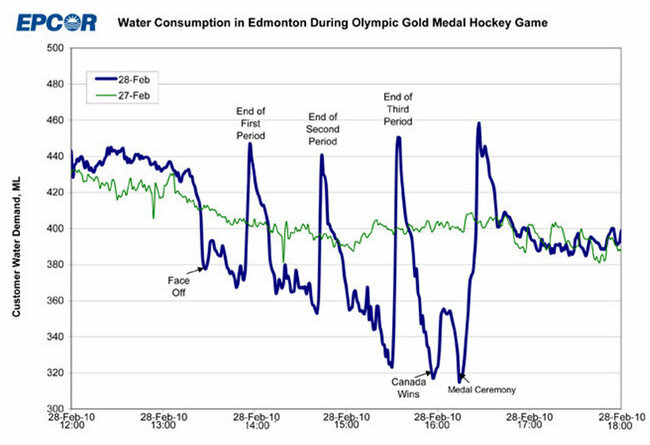 The difference in the peak and trough at the end of the ceremony is 140 million liters. In a city of less than 900k people, this is about 160 liters per person. That's a couple dozen flushes each. However, the biggest issue is that people aren't the only things that use water. According to this article, industrial water usage represents 40% of municipal water usage. So you would expect to see only an increase from 100% to 160% if someone did this. Now, my city, Calgary, used 176 billion liters of water in 2014. This is over 20 liters per minute on average. Surely the peak times are much higher than this mean. The 1.2 million flushes of one gallon of water taking one minute to fill would only increase the mean by about 6%, and surely the peak is significantly less. I think it's safe to say no, it would not come close to breaking. This is a hypothetical question - one that is unlikely to be answered by empirical evidence, so we need to rely on the opinions of appropriate experts. According to Michael Johnson, a civil engineer at the Utah Water Research Laboratory who models fluid flow in sewer systems, the consequences of mass flushing would range from negligible to pipe explosions depending on where you are. Most cities could handle the flicks of all those handles without the risk of a water hammer. “I would think that most cities have water supply systems that are robust enough to handle the refilling of all toilets simultaneously,” said Ed Maurer, a civil engineer at Santa Clara University and a hydraulics expert. “For example, if one tank served 25 percent of my city (25,000 people) and even if we assume everyone had their own toilet to flush, the standard 1.6 gal/flush toilet would create a total need for 40,000 gallons, which is equivalent to a small pool.” Not so much in the grand scheme of things. As for the outgoing sewage, we’d probably be saved from a plumbing disaster by a technicality: Simultaneous flushes don’t seem simultaneous from the perspective of the main sewer line. “A simultaneous flush would result in sewage arriving at a main trunk line from toilets further from the branch connection arriving much later than sewage nearer the branch to trunk connection,” Johnson said. In other words, rather than a peak, the main would receive a smooth curve of commode contributions. Not the answer you're looking for? Browse other questions tagged economics environment safety . How effective are reflectors at preventing pedestrian deaths? Is Donald Trump's ratio of bankruptcy to businesses consistent with the success rate of other entrepreneurs? Does placing a fly on a urinal improve cleanliness in men's toilets? Do cars drop 7% in value every month? Is filling multiple vehicles in one transaction at a gas station a safety hazard?